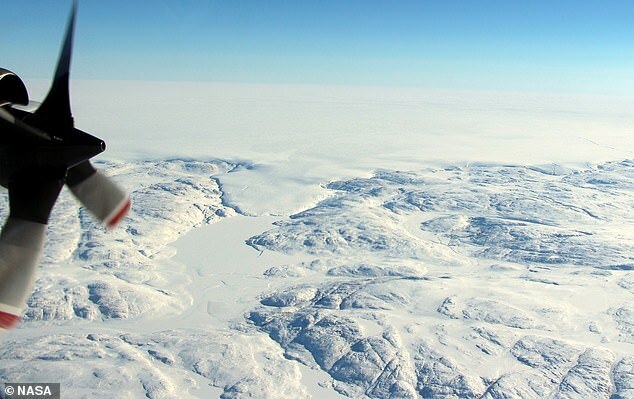 Scientists have discovered what could be a 22-mile-wide impact crater buried deep beneath Greenland’s ice. If so, it would be the second such discovery announced in the last few months. 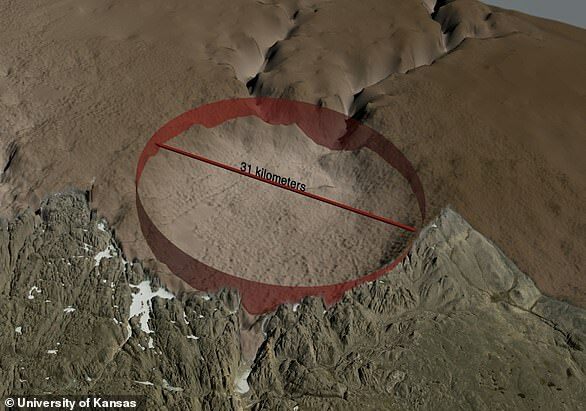 A NASA glaciologist spotted signs of the possible crater in northwest Greenland just 114 miles from the recently-discovered crater beneath the Hiawatha Glacier while scouring satellite imagery and topographic maps of the area. Exactly how and when it formed still remain a mystery, though the researchers suspect it may be more than 80,000 years old. 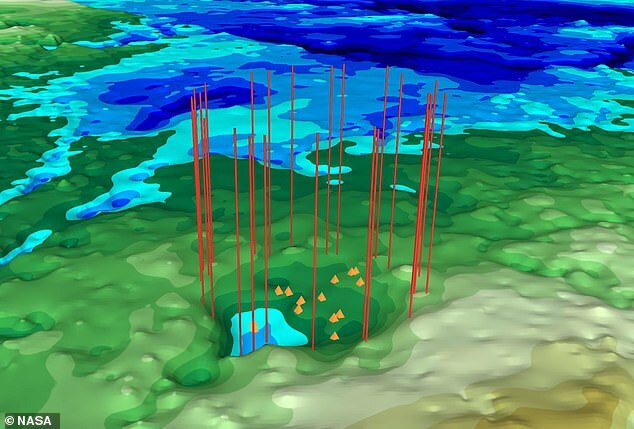 ‘We’ve surveyed the Earth in many different ways, from land, air, and space – it’s exciting that discoveries like these are still possible,’ said Joe MacGregor, a glaciologist at NASA’s Goddard Space Flight Center, who participated in the discovery of a crater previously announced in November 2018. That crater, estimated to be 19 miles wide, sits beneath the Hiawatha Glacier and is now the first impact crater ever to be found beneath Earth’s ice sheets. It was previously thought that most evidence of ancient impacts would have been erased by erosion of the overlying ice over many years. After the first discovery, however, the team began to suspect there may be others. ‘I began asking myself “Is this another impact crater? Do the underlying data support that idea?”’ MacGregor said. The researcher analyzed images from the Moderate Resolution Imaging Spectroradiometer instruments on NASA’s Terra and Aqua satellites along with those from NASA’s Operation IceBridge and discovered what appeared to be a bowl-shaped depression in the bedrock. The suspected crater is estimated to be 22.7 miles wide. According to the team, it would be the 22nd largest impact crater known on Earth, if it really turns out to be one. ‘The only other circular structure that might approach this size would be a collapsed volcanic caldera,’ MacGregor said. Though the new crater sits just 114 miles from the one announced in November, the researchers say they don’t appear to have formed at the same time. The ice in the area is at least 79,000 years old, the team says. 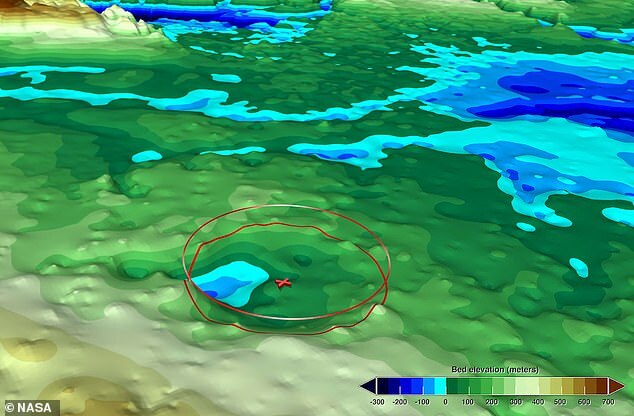 If this really is an impact crater, the researchers say it either happened more than 79,000 years ago, or, if it was more recently, all of the ice from the time eroded. ‘The ice layers above this second crater are unambiguously older than those above Hiawatha, and the second crater is about twice as eroded,’ MacGregor said. The team says it’s possible that the two neighboring craters were simply formed by entirely separate impact events. WHAT IS THE HIAWATHA IMPACT CRATER FOUND IN NOV 2018? Scientists recently identified what’s said to be the first known impact crater found beneath one of Earth’s ice sheets. 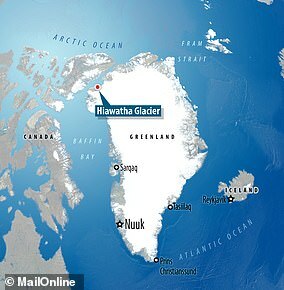 The giant meteor crater five times the size of Paris was been found half a mile (0.8 km) under the ice in Greenland. It is one of the largest impact craters on Earth, and suggests a 3,300ft-wide (1,000-metre) object made of iron smashed into our planet during the last Ice Age. It is believed the resulting explosion threw debris several hundred miles in every direction, reaching as far as modern day Canada . The 12-billion-tonne meteor landed with the power of 47 million Hiroshima bombs, obliterating all life within a 60-mile (100 km) radius, scientists said. 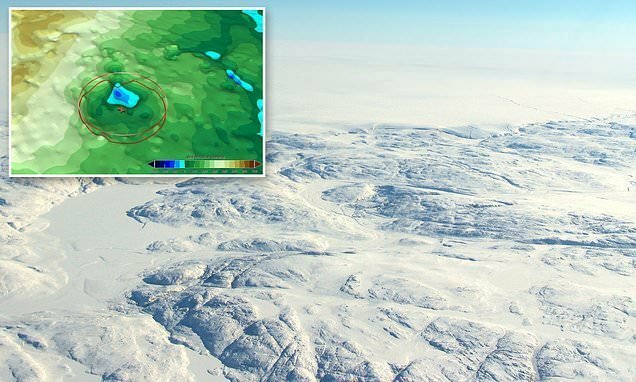 A 19-mile-wide (30 km) impact crater left by the event remained hidden for at least 12,000 years beneath the Hiawatha Glacier in remote north-west Greenland, although scientists have not categorically dated the event. It could be as long ago as three million years when Greenland’s ice sheet had already begun to form. The crater was identified with data collected between 1997 and 2014, supplemented with more collected in 2016 using an advanced form of radar sounding. This is consistent with Earth’s cratering record, they say. ‘This does not rule out the possibility that the two new Greenland craters were made in a single event, such as the impact of a well separated binary asteroid, but we cannot make a case for it either,’ said William Bottke, a planetary scientist with the Southwest Research Institute in Boulder, Colorado. ‘The existence of a third pair of unrelated craters is modestly surprising but we don’t consider it unlikely,’ MacGregor said.